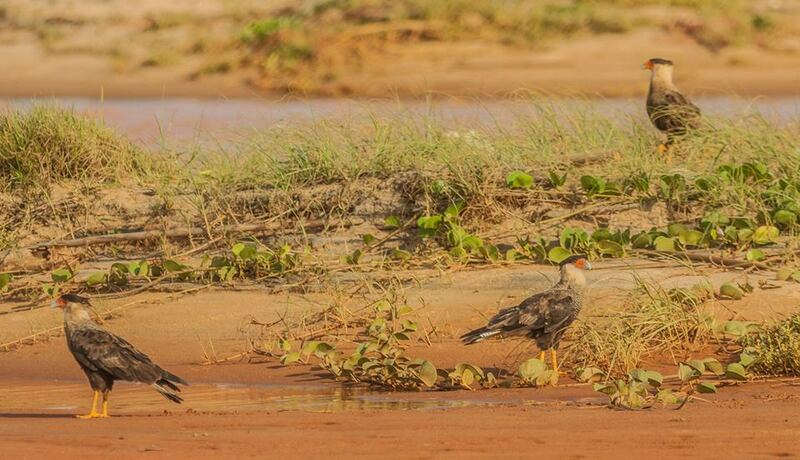 Wader Quest: The poisoning of the Rio Doce, Brazil. The poisoning of the Rio Doce, Brazil. 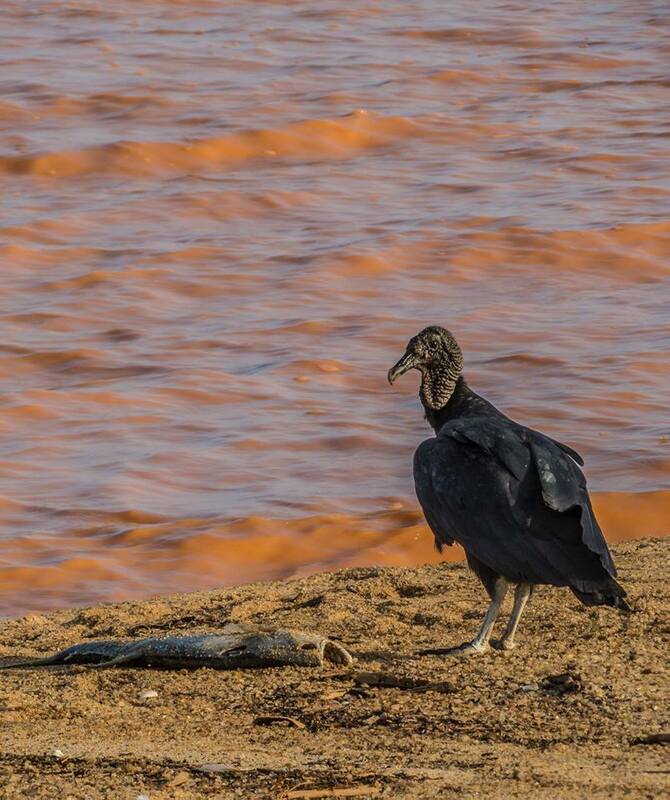 We are amazed and rather disappointed that this huge ecological disaster, probably the worst in Brazil's history, has not been given more media coverage outside Brazil except perhaps for articles about the financial cost to the companies involved, how much it will cost to put it right and who will pay what. There is much talk of billion dollar lawsuits where the lawyers will get rich and money will be paid over to a government which is under fire for alleged misappropriation of funds from many quarters. Little attention however has been paid to the inevitable ultimate sufferers from this human indifference, the wildlife. Once more finance and commerce trump conservation. 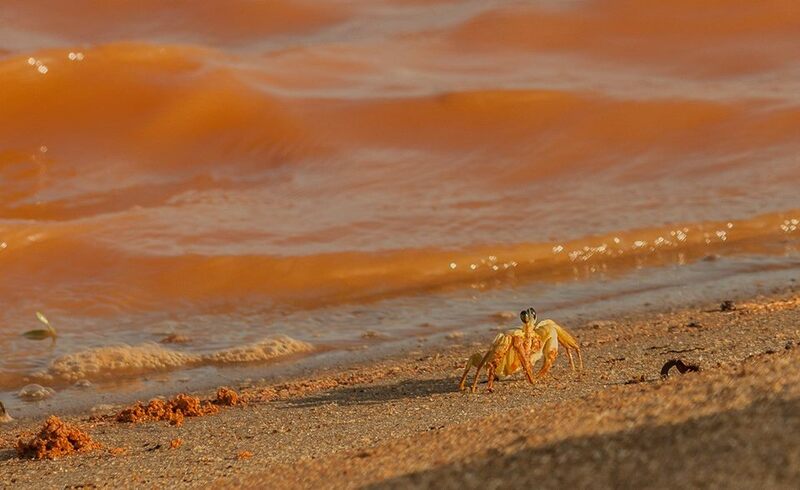 Pollution on the beach, Espirito Santo, Brazil. Before (right) and after (left) the disaster. 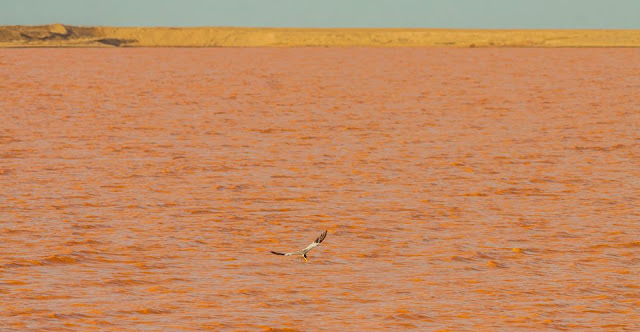 The bursting of the dam in Mariana, Minas Gerais Brazil, in early November caused the contamination of the Rio Doce (doce meaning sweet or gentle). About 60 million cubic metres of mud contaminated with mining residues arrived at the Atlantic ocean on the Espirito Santo coast spreading the contamination into the ocean. 13 people have died, as many are still missing and a village was wiped out in the disaster. The contaminants contained in this mud include arsenic, zinc, copper, mercury and chromium all of which make the water untreatable for human consumption and worse still have created a massive area of devastation in hitherto protected areas rendering them lifeless. Cabot's Tern Thalasseus acutiflavida over flying the water after (left) and before (right) the tdiaster. The stifling of the oxygen in the river will suffocate the invertebrates, the poisoning will kill the fish outright, this will cause a lack of food for the predators and those prey species that do survive will be contaminated passing the toxins on to the next level. But it is not just the wildlife along the river that will suffer. 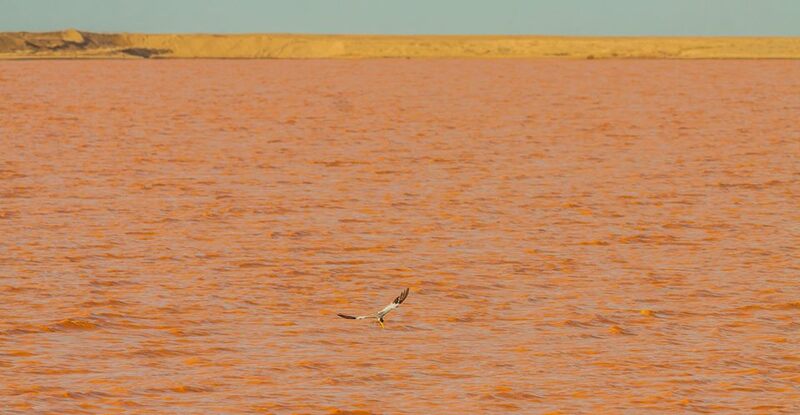 The plume of toxins has reached the sea, beaches where the rare leather-backed turtle breed are now affected and whales and dolphins that frequent the seas around the mouth of the river in order to feed will also be affected. A survivor... for now. Photo: Frederico Pereira. As the whole food chain is affected it is obvious then that at some stage waders will be involved in the equation as their habitat and food sources will be either destroyed or poisoned. 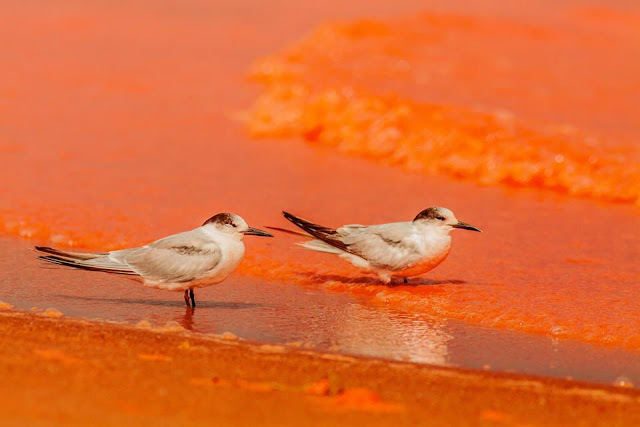 Many of the birds that will pick up contaminant residue will be migratory and they in turn will perhaps take these contaminants back north with them, if they survive or are fit enough to make the journey, so spreading the toxins still further. Exactly what a threat this will be is unclear, but it is something we should at least be aware of and perhaps those studying birds that are known to winter in the area could examine the birds, their eggs and young, perhaps take blood samples to see what effect, if any, this disaster may have on them. 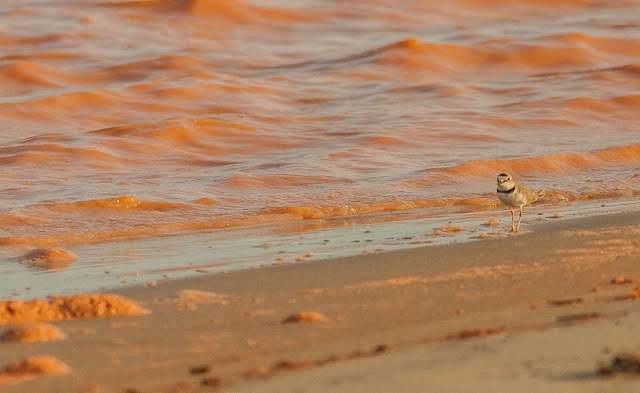 Semipalmated Plovers Charadrius semiplamata overfly polluted waters, will they take toxins back north with them, assuming they survive? The good surfing waves before (left) and much subdued after (right) the disaster. Photo: Frederico Pereira. 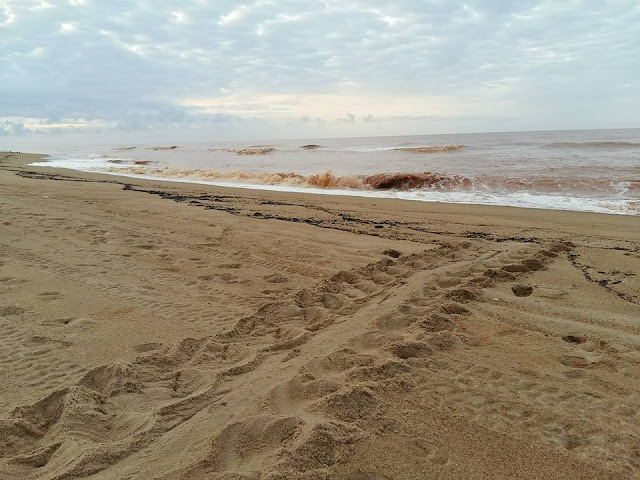 ... walking towards the river mouth we saw terns flying over the sea and some tracks in the sand from a turtle that had just laid her eggs, or at least tried to; we saw three such tracks, going up the beach and returning to the sea. 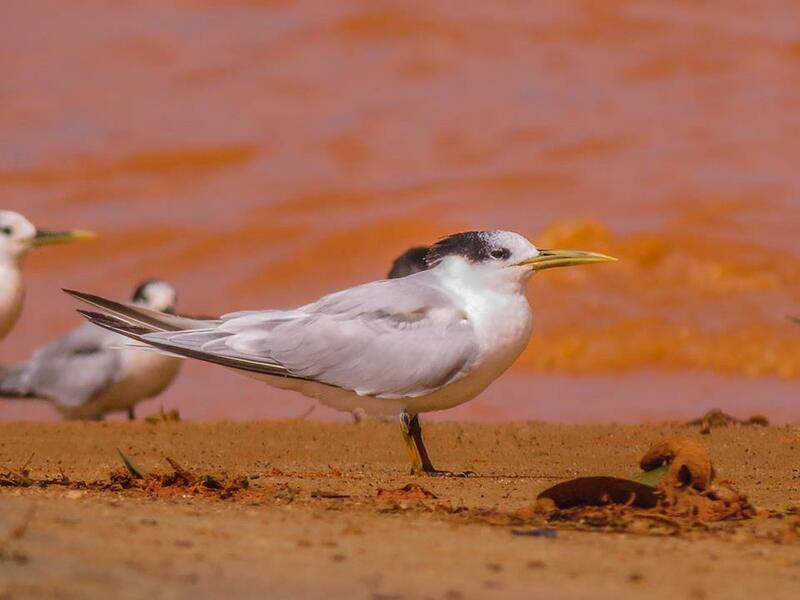 Cabot's (Cayenne) Tern Thallaseus acutiflavida. Photo: Frederico Perreira. ... and Common Terns Sterna hirundo sitting among the 'dirty' residue, some looking apathetic others not. Common Terns Strena hirundo. Photo: Frederico Pereira. 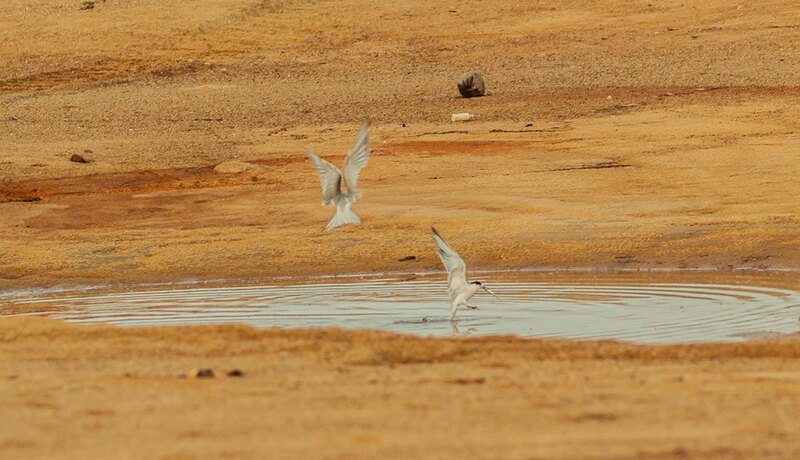 Soon after we came across some terns foraging in a small pool about 6.7m in diameter. I was shocked to see them taking dead fish, even though there was a number of live ones available, they seemed to prefer the dead ones. Terns taking dead fish. Photo: Frederico Perreira. Collared Plover Charadrius collaris. Photo: Fredeico Pereira. Semipalmated Sandpiper Charadrius semipalmatus. Photo: Frederico Pereira. 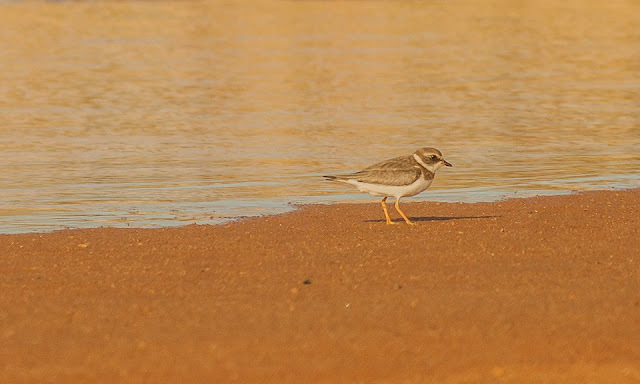 Grey (Black-bellied) Plover Pluvialis squatarola. Photo Frederico Perreira. Sanderling Calidris alba. Photo: frederico Perreira. ... and finally a Lesser Yellowlegs Tringa flavipes all apparently normal, foraging more actively than the terns between the foam deposits. 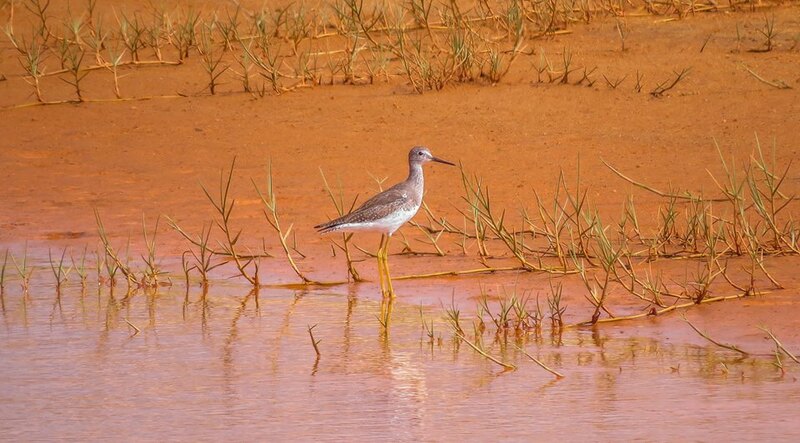 Lesser Yellowlegs Tringa falvipes. Photo: Frederico Perreira. Black Vulture Coragyps atratus. Photo: Frederico Perreira. At the river mouth there were many Semipalmated Plovers, Common Terns a few Large-billed Terns and Cabot's Terns, I also saw a small number of White-winged Swallows Tachycineta albiventer. Right in the river mouth itself there was an area where what must have been about 300 sandpipers and plovers congregated that flew as I approached to take a photo. 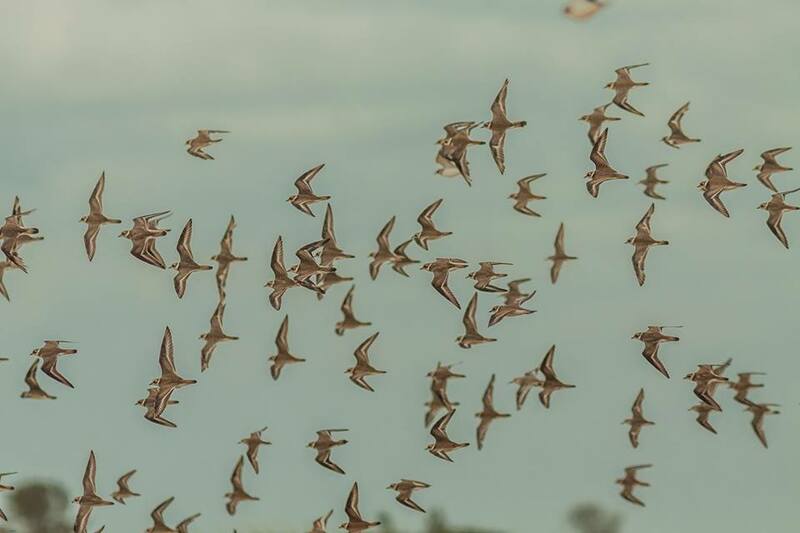 I took some photos before they flew and saw 6 White-rumped Sandpipers Calidris fuscicollis which I had not hitherto seen. 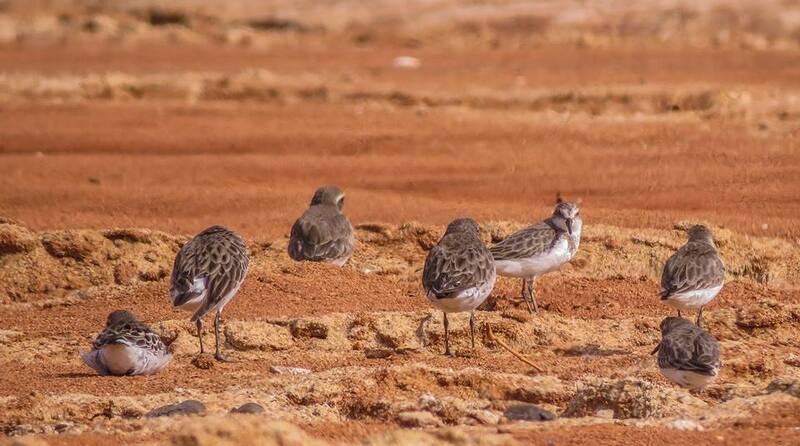 White-rumped Sandpipers Calidris fuscicollis (6) with Semipalmated Plover Charadrius semipalmatus (3d left). Photo: Frederico Perreira. 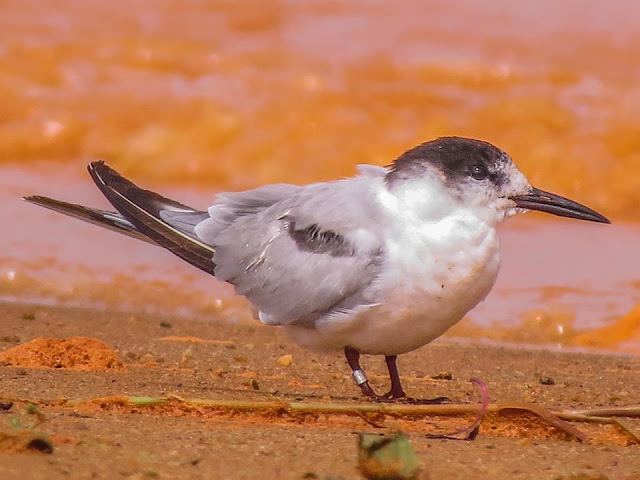 Returning to the town I saw some apathetic looking Common and Cabot's Terns one of the Common Terns had a metal ring, which I photographed but it was not possible to read what was on it, and it had its nasal aperture clogged with mud. Common Tern Sterna hirunda with metal ring. Photo: Frederico Perreira. This is what I observed between 05:45 and 10:00 in the morning; very sad. FPdCA. Mixed flock of mainly Semipalmated Plovers Charadrius semiplmatus. Photo. Frederico Perreira. 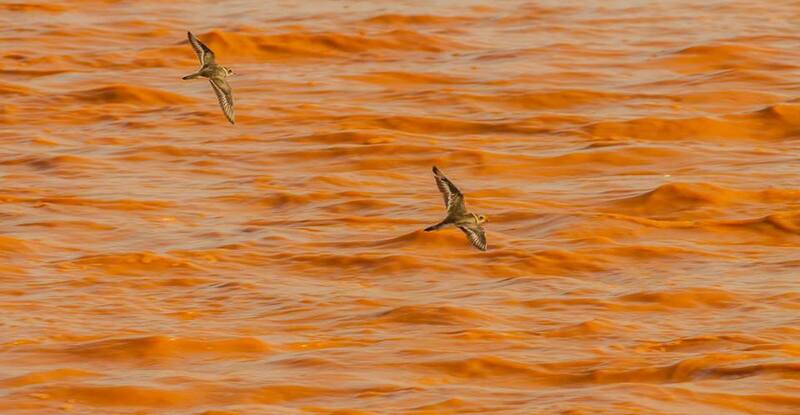 Time will only tell what effect this will have on the waders and other water birds to be found in the area affected. 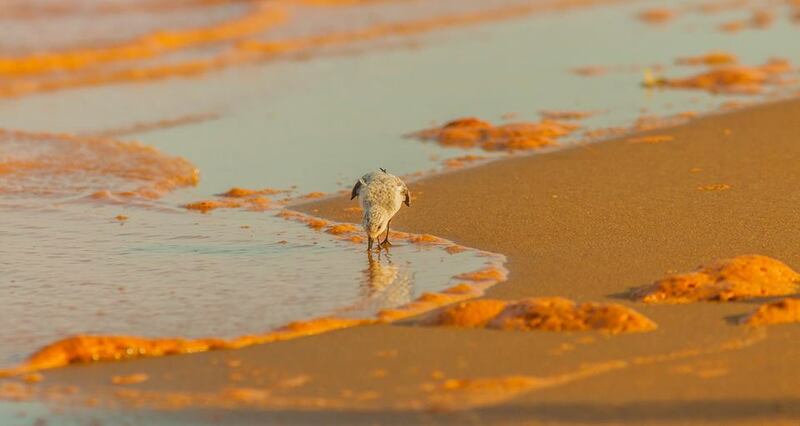 Apparently a representative of the companies concerned is walking the beach collecting the dead birds so the true scale of the tragedy may never be known. Thank you for your comment. Having lived in Brazil (Elis being Brazilian and all that) and having enjoyed some of the most amazing birding experiences of my life there, I feel a great connection with the country, its wildlife and the environment. 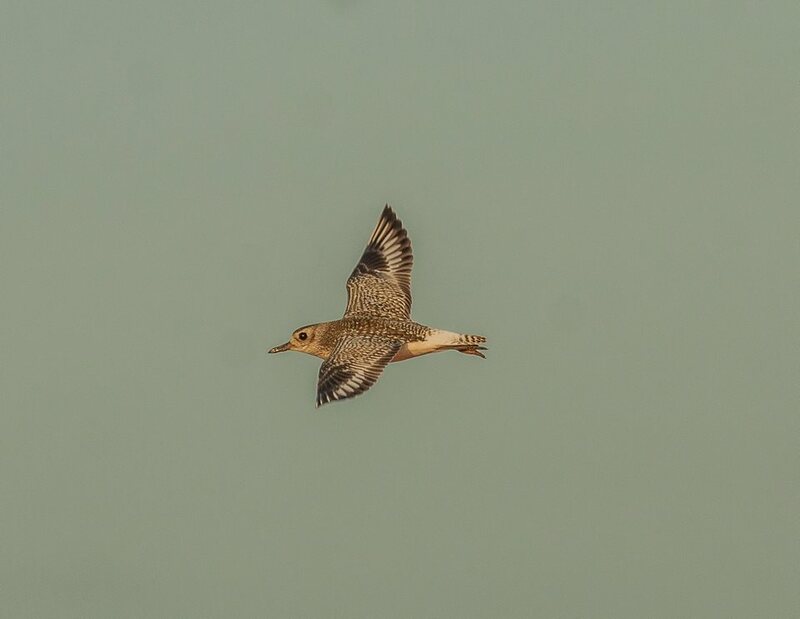 It saddens us to see such a terrible thing happening especially as it will certainly affect our favourite group of birds, the waders.